A Comprehensive Metabolic & Lifestyle Approach. A diagnosis of Alzheimer's disease in 2016 is startlingly similar to a half-century ago. Despite decades of research and millions of dollars invested in uncovering the causes and developing treatments for this devastating illness, progress has been slow, with each new 'blockbuster" drug proving to be as big a disappointment as the ones that went before it. Today, an Alzheimer's diagnosis is a death sentence. This is a revolutionary approach - one that has been discussed in the scientific literature for years but has only recently been given credence in clinical settings, thanks to extremely promising studies wherein Alzheimer's patients have experienced complete reversals of the condition. Medical and scientific journals are full of research showing alternate ways to fuel the starving brain, but no one has been bringing this essential information to the people who need it most'until now. Start reading The Alzheimer's Antidote on your Kindle in under a minute. Amy Berger, MS, CNS, NTP, is a Certified Nutrition Specialist and Nutritional Therapy Practitioner. She is a US Air Force veteran who now specializes in using low-carbohydrate nutrition to help people reclaim their vitality through eating delicious, wholesome foods, and teaching them that achieving vibrant health doesn't require starvation, deprivation, or living at the gym. Her motto is, "Real people need real food!" You can read her blog at www.tuitnutrition.com, where she writes about a wide range of health and nutrition-related topics, such as insulin, metabolism, weight loss, thyroid function, and more. 5.0 out of 5 starsThoughts for the future. I am still reading this book, so far have found it most interesting. 5.0 out of 5 starsA fantastic book that is as important as it is a pleasure to read! A fantastic book! I watched Amy's video that I found scientific at a very comfortable level (I am a scientist) so I was wondering about the way the book was going to be written. I must say it is written very similarly to how the video presentation went: pure pleasure, not too low and not too high in style and language. Very enjoyable. While I have not yet finished the book, I grab every minute of wait anywhere to read a page or two, so far my overall impression is that this book should be read by all. 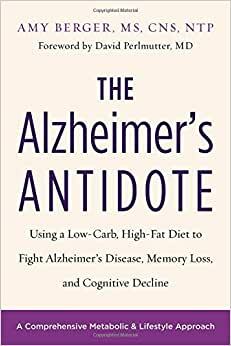 One need not have a friend or relative with Alzheimer's to be educated about diabetes mellitus (type 2) leading to Alzheimer's and other health conditions, as well as why scientists searching for the cause of Alzheimer's along the beta amyloid plaques are likely looking at symptom, rather than cause, and why most everyone would benefit from a reduced carbohydrate diet. She also explains how diabetes mellitus starts by insulin resistance of each organ separately rather than the whole body at once--this is known to all doctors and scientists (at least I hope it is known) yet still only the A1C blood test is offered for insulin resistance, which doesn't show any problems until insulin resistance is systemic. Amy also explains how important it is to start eating "right" (low carbs) from early age of 20s and 30s because the changes in the brain/body occur so slowly that by the time symptoms appear, it may be much harder to fix or too late. Prevention is the key. I highly recommend this book for everyone who wants to plan a healthy feature with healthy longevity. 5.0 out of 5 starsThe real question is...does it work? IT DOES! I purchased the paperback version of this amazing book. I have to say that I have honestly NEVER highlighted and annotated a book to this extent EVER. Amy Berger guides us through a tour of the root causes of this disease at a cellular and intracellular level. She does a fantastic job of using just the right amount of humor and provides simple visual analogies to help you understand what would otherwise be a complex subject. I was literally coming to points in the book where I was saying "WOW" out loud. I could not wait to share the information with my wife. The real question is...does it work? IT DOES! My mother in law has vascular dementia and has lived in a memory care facility for two years. She is now back home with us due to the poor care she was given and multiple medication errors. Her short-term memory was completely shot and she was often anxious, fearful, and depressed. She was declining fast both physically and mentally at the facility (which started feeding higher and higher carb meals towards the end). We now have her on a very low carb ketogenic diet. We are also adding MCT oil to various meals (titrated up from 1 tsp to 1 tbsp per day over a couple of weeks). After three weeks the depression and fearfulness are gone. The anxiety is greatly reduced. Today she actually remembered one of her caregivers whom she had not seen in 24 hours (she typically couldn't remember at all). Her countenance is also different and more "alive" and "warm". Her sense of humor is back. Her caregiver see's a definite improvement and is now a believer. She assessed her at a level 4-5 prior to this change in her diet and remarked that she would now assess her as a level 3-4. I am so thankful to Amy Berger for providing this very important and extremely well-written book. There is no doubt in my mind that it will be an invaluable learning resource for the millions of families suffering from any of the various forms of dementia (Alzheimer's). GREAT BOOK! My mother passed away with no memory and no leg muscles, the result of a double-whammy effect of the officially mandated low-fat, high-carb diet and statin drugs to lower her cholesterol. This experience intensified my search for information on health through nutrition, and in the process I have found out that we have been led down the wrong dietary path for decades. The ghastly effects of this mess we've been eating is appalling, and research is finally catching up. Amy Berger has done an absolutely bang-up job of presenting the most up-to-date information available that demonstrates the dangers of the low-fat, high-carb diet, and conversely, the huge benefits of the reverse- a high-fat, low-carb diet. This book is a very comprehensive work that covers the fallout from eating the way we've been told to eat for decades, how to change all that, and considers the situations that many face including care-givers for those in managed care (nursing homes) and those who prefer a vegetarian or vegan lifestyle. It's one-stop-shopping that combines information available in separate books on some of the basics of nutrition, the cholesterol myth, the dangers of statins, the dangers of the low-fat, high-carb diet and food and cooking recommendations as well as other lifestyle factors. I have read quite a few nutrition/health books over the years, and some are a bit more technical than I can drag myself through, but Amy has presented the information in a way that anyone can understand. Body chemistry is unbelievably complicated, making the processes involved rather difficult to explain, but I found this one easy to understand. I've been known to glaze over and skip to the bottom line at the end of the chapter, but I didn't have to do that with this one. There is some serious myth-busting here. Cholesterol causes heart disease? Busted! Statins for heart health? Busted! Dietary fat makes you fat? Busted! Saturated fats are evil? Busted! We desperately need to shift our thinking where our eating is concerned. Sugar and carb addictions have turned us into people that live to eat rather than people that eat to live. If you want to find out what you can do to save your brain and practical advice on eating to live and staying out of the Alzheimer's unit, get your copy now!